Riding in the car for children is great. Most of the time they fall asleep on long car rides. But they look so uncomfortable with their heads hanging down! I know I can't sleep like that. Why not get them one of these COOL pillows from CandiAndi so not only are they more comfortable but you can use them too! AND they smell good, with scents of lavender it will be easy for you and your children to fall fast asleep while traveling or just at home! No use in resisting, these unevenly shaped heart, star and moon pillows crave to be held. Each pillow is handcrafted in our cozy Colorado studio from the finest crushed velvets and silk brocades. We utilize ‘GREEN’ fills including all natural organic buckwheat hulls, flax seeds and lavender blossoms. These all natural fills give our heart pillows their squishy feel and make them impossible to put down, while allowing them to be heated or chilled for therapeutic use.Considered a form of soft sculpture, our decorative heart, star and moon pillows will make a stunning addition to any living area or bedroom. Surprisingly functional, the shapes of our pillows allow them to fit perfectly in the nooks and crannies of your body while snuggling with a loved one, lying alone while reading or watching a movie, or anytime your heart desires a little romance. 2. If you are already a subscriber just leave a comment that you are a subscriber.US entries only and one entry per person. Winner will be chosen on July 10th. MOM TIP - Family Movie Night is always a highlight in the Novotny home especially with our two youngest. It means they get to stay up later then their normal bed time, plus get to eat yummy treats while they watch the movie. Do you have family movie nights? What are your favorite MOVIES to watch as a family? Do you have YUMMY treats? What treats are your kids favorites? Our choice of movie for family movie night is usually the latest age appropriate movie that is available thru Netflix and our newest favorite YUMMY treat is Kernel Season's Popcorn and their seasonings. MOMS - you have got to pick some of this up on your next grocery shopping trip. The Novotny's have become addicted to the variety of seasonings. Before I go on I want to say we at 24/7 MOMS do NOT get paid to review products, the only benefit we get is the opportunity to test and try them out which not only do we love but so do our husbands and kids. So , back to our new favorite treat - Kernel Seasons offers a variety of seasonings, 14 to be exact everything from Ranch, BBQ, Garlic, butter to Carmel and kettle corn. They also offer popcorn in both microwave and stove top versions along with the best tasting butter toppings - it actually tastes just like we are at the MOVIES eating hot buttery popcorn. So my REAL mom TIP is check out their web site for great popcorn ideas, recipes, and how you can get your own Kernel Season's products for your next family movie night or even gift packs for gift giving. I'd invite you over to share ours, but I'm afraid to say my kids are not so willing to share this new treat. Time for a lesson in sharing once again. Your children will think you are the coolest mom who knows how to serve Movie Theatre popcorn. I just ate onions for lunch and forgot I have a mommy meeting! I have a toothbrush, at home but of course I am already on my way to the meeting. Or the dentist, actually I always eat garlic before I go to the dentist just as pay back for the pain he will eventually put me though! I am sure the Mommy's won't care about my onion breath but I will. DENTABURST® is a great new way to primp your smile, anytime, anywhere! The world is ours for the taking. Everyday we have opportunities to meet new people, make great impressions and experience exciting things. We're on-the-go, we're forming new friendships, finding romance and networking for our futures. We're making choices and creating routines that define who we are and what we stand for. To shine we need confidence that can come with a short, if only momentary, pause to say, "I'm ready," before moving forward to whatever comes our way. DENTABURST® Freshening Teeth Cleaners was created for that pause empowering confidence that comes with long lasting fresh breath and a clean, bright smile. 2. If you are already a subscriber just leave a comment that you are a subscriber. US entries only and one entry per person. Winner will be chosen on July 10th. I have this weird car issue that if I am riding in the back seat of a car I get car sick. Not sure why? So I tried some great all natural lollipops called Queasy Pops from Three Lollies, now you may have heard of Three Lollies before as they also make Preggie Pops which helped my through my first trimester of morning sickness! Green apple is my favorite flavor! Developed by healthcare professionals to provide relief from the queasy stomach associated with motion sickness and chemotherapy. Queasy Pops are effective due to our special formulation of essential oils from natural herbs and aromatherapy, in combination with our unique delivery method. Our ongoing empirical and anecdotal research to improve and develop our unique flavors has proved satisfying for our many customers. Queasy Pops also alleviate dry mouth, provide quick calories for a nice energy boost and are overall very soothing and comforting. WIN: 24/7 MOMS and Three Lollies are giving away a case of Queasy Pops to TWO lucky readers. To enter for your chance to win . US entries only and one entry per person. Winner will be chosen on July 3rd. Each week I look forward to my emails from Taste of Home - their recipes are what I call perfect MOMMYstewart - Simple, Fun,Yummy and even look like Martha made them. Yet we busy moms can actually create them for our families successfully. I'm obviously no Martha Stewart so, I need the MOMMYstewart ideas from Taste of Home. 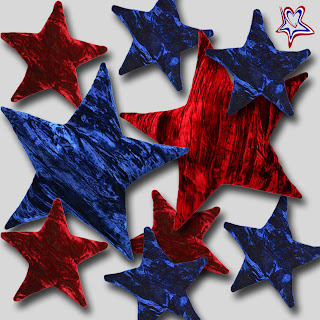 Today I discovered some perfect 4th of July recipes that are simple and we MOMMYstewarts can create. Now to decide which one I will make for our 4th of July Celebration. Taste of Home's Cupcake of the Week Newsletter - sign up FREE today! Prepare cake mix batter according to package directions. Fill paper-lined muffin cups half full. Bake at 350° for 11-14 minutes or until a toothpick inserted near the center comes out clean. Cool for 10 minutes before removing from pans to wire racks to cool completely. Working quickly, spread ice cream over cupcakes. Freeze for at least 1 hour. In a large bowl, combine cream and marshmallow creme; beat until stiff peaks form. Pipe over cupcakes; decorate with sprinkles and colored sugar. Freeze for 4 hours or until firm. Yield: 3 dozen. Editor’s Note: As a substitute for blue moon ice cream, tint softened vanilla ice cream with blue food coloring. This recipe is Simple and festive for the 4th of July celebration. In a large bowl, dissolve the berry gelatin in 1 cup boiling water. Stir in 1/4 cup cold water. Pour into an ungreased 9-in. x 5-in. loaf pan. Refrigerate until firm. Repeat with strawberry gelatin and remaining boiling and cold water. When gelatin is set, cut into cubes. Just before serving, gently combine gelatin cubes and pears in a large glass bowl or individual dishes. Yield: 6-8 servings. Taste of Home - try a FREE ISSUE today! Does it get any more patriotic then this? a perfect yummy dessert all will enjoy. Family and friends will say "Hooray!" when they see these star-spangled cookies from the Taste of Home Test Kitchen. Make these treats throughout the year by using different cookie cutter and food coloring. Have you ever struggled to dislodge a nostril-bound Cheerio while navigating the interstate at 70 miles an hour? Discovered exactly how many renditions of “Row, Row, Row Your Boat” it takes for you to pull the car to the side of the road and weep? Or experienced just what happens when your miniature traveling companion pulls the “manual override” lever on the emergency exit door of a plane? You're not alone. We all have memories of a hideous yet hilarious family trip. Watch out World Wide Web 24/7 MOMS is about to ROCK it again - Tune in this Tuesday night 7pm PST / 10pm EST for the NEXT edition of 24/7 MOMS Live - more great giveaways, Tips, and great MOMversation with REAL moms like you. Our topic this week will be "Secrets To Grocery Store Savings" and my co-host this week will be Tanya...yes moms I'm pulling her away from the key board and having her chat with us LIVE. Did I mention I can't wait to eat the SWEET of the week in front of you ...I think you are going to droll over it and one of you will WIN your own SWEET of the week delivered to your home. So who has heard the song The Wheels on the Bus over, and over, and over...you get the picture! We have one, count them ONE children's CD in the car for road trips, granted it's a great CD but i get sick of hearing can you turn on the monkey song again and again. I found this GREAT cultural experience for the car, Putumayo Kids European Playground CD! Putumayo Kids is the children’s and educational division of Putumayo World Music. As one of the leading children’s record labels, Putumayo Kids is committed to introducing children to other cultures through music from around the world. With its growing collection of CDs featuring multilingual liner notes, Putumayo Kids produces music that entertains, educates and inspires cultural curiosity. More than 3 million Putumayo Kids CDs have been sold around the world. At least one percent of the CD sales benefit non-profit groups that support children, families, schools and other charities. Putumayo World Music has contributed more than $1 million dollars to non-profit organizations that do good work in the regions where the music originates. Putumayo Kids CDs can stimulate, engage and inspire – giving children an opportunity to express themselves and experience new and exciting cultures with music that will make the whole family tap their feet. The Putumayo Kids music team chooses songs with child-friendly lyrics and rhythms by both renowned and undiscovered international artists. The collections of songs are tested in schools and with families. An international music selection contributes to the education of future global citizens while holding true to Putumayo’s mission of sharing music that is “guaranteed to make you feel good”. Teachers around the world use Putumayo Kids teaching guides, activity kits and CDs in their classrooms. Putumayo has also provided multicultural teacher training programs to school districts. The company has donated thousands of CDs and kits to schools and organizations with various global education initiatives. Putumayo Kids also offers a series of downloadable Teaching Guides that accompany selected CDs from our collection, available on our Web site: www.putumayokids.com. These four-page Teaching Guides provide three activity-based lessons that connect geography, social studies, and the arts with the songs on the albums. I've never been to Hawaii, but I know my son is LOVING learning about it (and so is mom and dad)! We have this book in our van and take it everywhere we go. The Complete Hawaiian Reef Fish Coloring Book includes over 200 colorable illustrations to help you learn to identify these colorful and fascinating fishes. Each illustration is accompanied by a complete description of the fish, including the scientific, common and Hawaiian names. Their anatomical features, coloration, body designs, feeding habits and reproductive strategies are also explained in a fully illustrated section devoted to these topics. In addition, an overview of coral reef ecology is provided to help you understand the relationship between the fishes and the coral reef. This book is recommended by Save Our Seas for use in Hawaii's classrooms. It is also a great way to get your kids interested in science while on vacation. Available online at http://www.lucid-hawaii.com/ or in bookstores and gift shops in Hawaii. If you're always struggling to find a convenient way to provide water for your furry friends during a hike or while traveling, here's the answer! Cloud Star foldable water bowl. Step 1: Become a fan. The Novotny's are learning to pack less and less these days - Airlines are now charging per bag and that can add up quickly with a family of 7, traveling in the car can get a bit crazy when we over load the car and we have to put luggage under our feet and even on our laps . So, the best way to save money and to travel more comfortably is to PACK LESS. Earlier this week on 24/7 MOMS Live we were Chat-tin it up about Traveling with kids and here are some of the GREAT ideas we shared. Crushable duffel bag into an outside zippered compartment on my largest suitcase, and we have yet to return home without using it. If I check my bag and it happens to be over the weight limit, I just take out the duffel and transfer some of my belongings into it so I can avoid the penalty. Other times, we use it to bring back souvenirs that we bought on vacation. If you’re going to check your child’s car seat, know that (a) it will usually be counted as an extra bag and (b) the baggage-handling machines at airports can really be rough them up. Pack into a duffel bag. As a bonus, we can store an extra supply of baby gear—diapers, wipes, etc. Use Rubbermaid storage bin with a snap close lid for each member of the family. Line bins up outside of camper and leave them there. The bins are weatherproof and bug proof when shut all the way. Now there’s no need to keep running in and out of the camper all the time for a forgotten hat, dry socks, or towels. Bonus is the extra room inside the camper. Resist your children’s pleas to allow high-tech gadgetry at your camp. You’ll give them the gift of being able to entertain themselves without their TV, Game Boy, laptop, or iPod. They will learn how much fun it is to just talk, play cards and board games, and get lost in their own thoughts. And best of all, they will be able to truly tune into nature. Travel Bag- design a bag for travel only. Keep and storage travel items inside for ease of packing. Keep a Ziploc bag of crayons and mini-markers, coloring and activity books. Handi-wipes, hand sanitizer, tissues, buy trial sizes our doubles of your shampoo, body wash, toothpaste, contact lens solution, deodorant, lotion, and so on for your toiletry bag. Don’t forget a hairbrush, toothbrush, tweezers, and mini first-aid and sewing kits. Use a gallon-size Ziploc bag for anything like makeup or medication that needs to be unpacked when you get home. Your fully-stocked toiletry bag can stay right in your luggage for your next trip. Roll and GO: Instead of folding clothing items, roll them into tube shapes, then stack them. Your clothes will fit far more neatly, they’ll rarely wrinkle, you can fit far more in, and even kids can help pack with this method. Less is More-avoid taking too much stuff on vacation, lay everything out then try to pack only half of the items. Pack each child a backpack with things to do, snacks, their favorite blankie and even a change of clothes for flying or car travel. Surprise bags...include pipe cleaners, new book, snack, color pencils (no crayons/markers), trading cards, journal/notepad, and any other fun things you can find. Deal of the day - FREEbie Veggie Tales DVD when you sign-up for their E-Newsletter. *$2.99 Shipping applies. Offer valid while supplies last. One free DVD per customer with valid account and newsletter sign-up. Click Here to get your FREEbie DVD. Storytelling is a great part of life that children learn at a very young age. My son is still learning it and I encourage him often to use his imagination. He cannot read yet so I tell him to make up the story and we tell each other our version of the story. Tell Me A Story CD's are beautifully expressive voices, gorgeous music, and unexpected multicultural folktales, fairytales and legends fill Tell Me a Story, Tell Me a Story 2: Animal Magic, and Tell Me A Story 3: Women of Wonder. Those accustomed to standard story fare through put-the-kids-to-sleep story CDs will find these tales from Amy Friedman's popular syndicated newspaper feature a breath of fresh air. Listeners are swept away to exotic lands, captivated by spirited heroes and heroines on adventures with plenty of wisdom from around the world, without an ounce of "preachiness." While these audio tales are ideally suited for children 5 and up, those as young as two and three are intrigued as each tale is accompanied by original music and readings are by some of stage and screen's most talented performers, so the voices captivate and intrigue. Releases one and two have been honored with Parents' Choice Silver Honors and National Association of Parenting Publication's gold medals for story telling as well as rave reviews from everywhere--School Library Journal to Cool Mom Picks and beyond. Women of Wonder will be released on July 1. WIN: 24/7 MOMS and Tell Me A Story are giving away a copy of Tell Me a Story and Tell Me a Story 2: Animal Magic to ONE lucky reader. Nate-no my 7 year old son thinks it is the coolest thing when the big brown truck stops in front of our house and delivers a box containing something he gets to test out , he believes he is an official Kid Tester and takes his job very seriously. 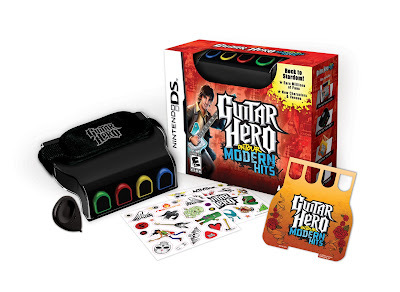 So, this past week when he was given the opportunity by MOM Central to out the new the Guitar Hero On Tour: Modern Hits game for his Nintendo DS there was not a chance he was going to say "NO" to this one. Being he has been dreaming of owning Guitar Hero for his Nintendo DS so that he could take it along where ever he travels. He was asked to test out both Guitar Hero On Tour: Modern Hits game and the Guitar Hero On Tour: Decades game so that he could test out the additional features for multi players. Not only did he get his brother to play with him he even recruited neighbor kids to test out the multi player mode using both games as they competed against one another and shared songs between the two games- I guess you could call it Nintendo DS Battle of the bands. This MOM is positive Nate-no's new Guitar Hero games are going to bring additional fun to our family travels this summer as Guitar Hero for the Nintendo DS is the perfect take along family fun game, being we enjoy the Guitar Hero game we have for our PS3 so much. The Handheld guitar players can now choose how they raise-up their band from the underground music scene to worldwide rock stardom in Guitar Hero® On Tour: Modern Hits. Featuring a set list comprised of 28 master tracks from influential artists including Coldplay, Fall Out Boy, Tenacious D, The Strokes and Weezer, Guitar Hero On Tour: Modern Hits expands on the innovative Guitar Hero® gameplay on the Nintendo DS by introducing an all-new Fan Request system that challenges players to jam like never before. Fret board fanatics can once again unleash their inner rock stars anytime, anywhere as they hone their shredding skills and jam to face-melting modern rock tracks from the last five years in Guitar Hero On Tour: Modern Hits. Rock out to today’s hottest tracks – Shred along to 28 master tracks, all modern rock hits from some of the hottest bands including Coldplay, Fall Out Boy, Tenacious D, Weezer, The Strokes and more. Players will tour through five all-new venues that are as extreme as the tunes played in them. Rock out anytime, anywhere – Fans can take the Guitar Hero experience wherever they go with Guitar Hero On Tour: Modern Hits. The Guitar Hero™ Guitar Grip™ mimics a guitar fret board and fits seamlessly in people’s hands to deliver the same core game play that defines Guitar Hero. End Result - Official Kid tester Nate-no gives it the 24/7 KID stamp of approval he thinks every kid who owns a DS should run to the store, ride their scooter or get their mom to drive them and buy their own version of Guitar Hero On Tour: Modern Hits for DS and start practicing so one day he can battle your kids. In my recent search for new sunglasses for our two youngest boys I discovered Julbo Sunglasses not only are they cool looking for both boys and girls they are great protection for my kids eyes, I love the look and the benefit of Julbo sunglasses for my kids definitely a 24/7 MOMS approved pair of sunglasses. I also became a bot more educated on the importance of good eye protection for my children. What is so important about eye protection for children? WIN: 24/7 MOMS and Julbo are giving away one pair of GIRL -Kitty Sunglasses. To enter for your chance to win. Yesterday we talked about the "Must Takes" when traveling with kids today we will share our Cheap travel ideas with from the MOMversation on 24/7 MOMS Live web cast. - Use frequent flier plans through credit cards. -Trekaroo: Sign Up for Alerts, Deals – Many airlines offer “deals of the week ” specials, or affordable one way fares, but it’s not easy to stay on top of them all. Through partnerships with Expedia and others, Trekaroo will announce deals through Twitter (@Trekaroo), as well as a monthly newsletter. - Flying TIP: Pick up at the Departures concourse, rather than at Arrivals. The line at Arrivals is always torturous, whereas there is never a line at Departures. This strategy works great when you call a taxi or town car, too—just tell the dispatcher to pick you up at Departures. -Rent houses (i.e. Florida) vs. hotel. -Stay at hotel that offer “kids play free” or all-suites hotel with kitchen facilities. (Helps avoid eating out). - No WiFi-? ?Need to stay connected? Search ahead and you can also find wi-fi hot spots around the country with Wi-FiHotSpotList.com. -Picnics - Bring a backpack, find a grocery store and get some French bread, cold cuts, cheese and beverages. -Eat out for lunch instead of dinner. Usually cheaper menu. ahead by gathering coupons for nationwide restaurants and grocery stores. - Calling Tip: Avoid calling Fees i.e. (555-1212 and 411) to get a phone number for a restaurant or hotel. Everyone should program this number into the speed dial of their cell phone: 800/GOOG411. It’s a completely free telephone information service from Google. -Coupons; Figure out which museums, parks and attractions you are going to want to see during the trip. There are coupons for most major attractions online. If you can’t find a coupon for the place that you want to go, call and ask them if they offer coupons. Many places will tell you where to find coupons with just a simple call. -Entertainment Books for the city you plan to travel. -On-line... attractions (theme parks, zoos, museums, etc) book passes online ahead. -Call local attraction and ask where you can buy coupons/check local grocery stores. Think outside the weekend-to-weekend vacation box. Sometimes shifting your flights one or two days forward or back can make a big difference in airfare. Also, midweek flights are often less crowded, which makes for a more pleasant trip. “Let’s Go” book by Harvard Students Agencies for lower cost hotels in Europe. This July our founder Trisha is attending BlogHer '09. Being there she will be exposed to hundreds of contacts who she will be exchanging business cards and information with. Well this year she will be able to save some paper, and some data entry by using the newest, greatest, contact management tool on the market a StartPoken! StartPokens are a very simple time saving device. First you meet your contact face to face. Then touch your Poken hands together for 1-2 seconds to swap contact info. to reveal the USB connector. Sign-in to your master account and your new contacts are added. Poken supports vCards and all social networking websites including Facebook, Twitter, MySpace, Orkut, Flickr and more! You choose which of your social network profiles you would like to share with people when you meet them in the real world. A small logo of each social network you choose is displayed as a link on your « Poken Card ,» which shows only your most basic information. Your contacts can view your Poken Card on doyoupoken.com, but, if they want to see more, they only have to click the logo to see your profile on the social networking site you’ve chosen to share. On the Poken site you and your friends can view your contacts alphabetically, or chronologically in your "social timeline." You can also send messages, group contacts with a label, write notes for yourself about each contact, and so much more. The goal of Start Poken is to spread the word about Poken technology and provide superior service to our customers in the US and Canada (startpoken.ca). While the retail side of the Poken market is taking off, they are also able to customize the Poken for individual corporations. For example, if a large company were to sponsor a conference or event they customize the pokens with their logo or a specified design so that they can have brand awareness and also provide a convenient method of information storage for all of the participants in the events. You have several chances to win your very own StartPoken. StartPoken is currently hosting a pre-BlogHer twitter campaign. They are having Twitter contests to win Poken every Tuesday between now and July 21st. People can follow @startpoken and @teamstartpoken to get directions for each different contest. WIN: 24/7 MOMS and StartPoken are giving away ONE StartPoken to one lucky reader. To enter for your chance to win. Deal of the Day - BOGO (buy one get one) FREEbie Jamba Juice. 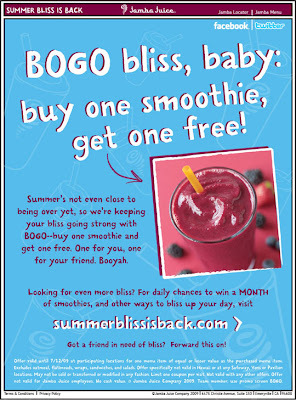 Click here to get your FREEbie BOGO coupon. Offer is good until 7/12/2009. Where were you Tuesday night? If you were not sitting in front of your computer watching the 24/7 MOMS Live web cast YOU MISSED out. We had a GREAT time of MOMversation chatting about "Traveling with Kids" from what the must takes on a trip are to cheap ways to travel. Then we moved along to our TIP Talk segment sharing our favorite 4th of July celebration ideas, we even demonstrated a super yummy desert, that was definitely a must make, must eat summer desert, and YES we ate it right in front of all our viewers while they drooled wishing we could invent away to pass food through the Internet. We gave away fabulous prizes from huge and I mean huge coloring books from www.coloringbook.com to the coolest pic-nic /carry bag from resienthal (www.reisenthel.com) plus giveaways during the after the show chatting it up time which was another blast chatting with all of our mommy Friends about the MOMhood journey as we share and laugh together. Ah, yes I don't want to forget the yummy SWEET of the week we also got to eat in front of you Sweethearts new red, white and you candies....WOW, are these Show hosts rude or what? always eating in front of their viewers. The SWEETHEART candy was delicious and I can't wait to create my 4th of July party favors and share them with our friends. 1. You can watch our past shows by clicking on the movie camera on the screen at the top of our blog . 2. You can tune it next Tuesday night 7pm PST / 10pm EST for the NEXT edition of 24/7 MOMS Live for more great giveaways, Tips, and watch us eat even more yummy sweet treats. Hope to chat with you next Tuesday night - our topic will be "Secrets to saving money at the Grocery store" plus so much more. P.S. Read this weeks blog posts for all the great stuff we chatted about on 24/7 MOMS live including our YUMMY recipe. When traveling to large theme parks or busy places I always find carrying a purse is VERY inconvenient not to mention in some areas a good side job for pick pockets! Have you ever stuck something small you needed in your sock or shoe or up your sleeve (etc...) just because there was nowhere to put it? If so, then THIS is for you! PortaPocket® carrying cases are designed for your active lifestyle -- they're simple, lightweight, comfortable and convenient. Perfect for all those times when you just want to carry a little something -- without requiring the use of a larger purse or bag. You'll find they're great for carrying everything from keys, gym passes and credit cards, to IDs and business cards, medication, contact lens cases, jewelry, makeup, hygiene items and just about anything else you can think of that's small and important. PortaPocket® carrying case Accessories allow you to carry slightly larger items, also. PortaPocket® carrying cases are designed to fit your calf, thigh, ankle, arm, or waist, and are optionally discreet as they can be worn over or under your clothing. Since you won't need a hand to carry your PortaPocket® case, you'll have freedom of movement going about your day. The detachable pocket offers you ease of use in having both hands to work with while inserting and removing items from it, yet stays firmly in place when in mounted position. Now that's versatility -- and at a price you can afford! So helpful when you're out & about --Be confident & minimize theft risk. WIN: 24/7 MOMS and PortaPocket are giving away one black PortaPocket, Essentials+ kit and a set of the Accessory Pockets w/Belt-loop style mountings to ONE lucky reader. To enter for your chance to win. Our Family enjoys traveling whether it's flying across the country or camping in our RV we enjoy the adventure. 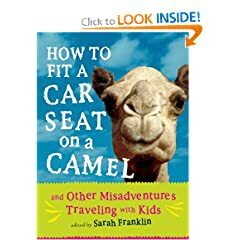 So, over the years of our travels I have learned what the "Must Takes" for a family traveling with children are. Good attitude, don’t sweat the small stuff. -baby wipes/wet ones even if you don’t have a baby- wipes down everything, hands, feet, toilet seats, etc. - Music, make sure you have portable CD players with fresh batteries and a stockpile of their favorite CDs for the trip and/or something for “white noise”. -denture cleanser tablets; for cleaning pacifiers, baby spoons, sippy cup lids, and anything else that is hard to sterilize on the road, just fill a glass with warm water, drop in the item, and pop in a tablet. - Snacks; LOTS and LOTS finger food, fruit or nuts, avoid sugary/sticky snacks. -Books on CD -With the huge market of kid books out there, there is a tremendous number available on audio disc. These stories last for hours and will keep your child entranced for some time. -DVD’s, rent movies from library or exchange/borrow from friends. -Portable game devices (don’t forget charger). -IPOD- free audio stories for children from Storynory. -MP3 Players you can download books to these along with music. Activities Without Batteries- the kind that use their imagination. -I Spy with My Eye. -License plate games, like counting to see how many different states you can find, or try to make a sentence with the letters in a passing cars license plate. - Puzzle Books but have big enough print to be able to read easily in a moving car. Try to avoid reading books, unless on a plane, the small print with the moving car could equal a sick child. - Word Search puzzles www.Puzzle-maker.com. -Road games got to www.momsminivan.com/printables.html. – Make up your own road scavenger hunt game. Write out a numbered list of 20 things that you'll likely see on your route. Include vehicles (truck, minivan, motorcycle, police car), animals (cow, dog, horse, bird), and buildings and other roadside items (barn, stop sign, church, fence, bridge). Photocopy the page for every child, and hand each a crayon. The first kid to spot all the items on the list wins. For kids too young to read, use pictures instead of words. - Pipe Cleaners—making necklaces, swords, bracelets, towers—anything. -Colorforms play sets with reusable vinyl stickers can occupied kids for HOURS. These sets are very portable and they would be great for car trips, too. -Stopwatch, Jump ropes, sidewalk chalk (for playing hopscotch and four-square). inflatable ball, etc.-encourage kids to burn off some of their excess energy at highway stops. -An inexpensive metal cookie sheet makes the best lap table for a child during car trips. It can be a food tray or a writing desk (the raised edges keep crayons from rolling off). It can be a clipboard with the addition of a clip-style fridge magnet. It’s an instant play table for all sorts of magnetic toys, simple letters and numbers, farm animal magnets, magnet books, Magnet Wheelies kits, magnet dress up toys, and Magnetix. -Journal/camera, let little ones chronicle the journey from her point of view! Have her take pictures of stops you make along the way. The pictures will make great keepsakes and create another busy-bee project for later: A scrapbook If you don't trust your kids with your expensive digital camera, consider buying a disposable camera for each child at the start of your trip. - Postcard/Picture TIP: Postcard twist- Hazel Mail, converts your vacation photo into a postcard and send it anywhere in the world for $1.50. -Tylenol (or whatever you prefer) so that you don’t have to worry about tracking down a drug store in a strange neighborhood at 11 P.M.
-Benadryl some parents swear by it and some parents detest it, but Benadryl can go a long way. Especially with long flights, giving you child something to help them sleep can make everyone a lot happier. -Laundry detergent in Ziploc bag or save your sample sizes for travel also don’t forget stain sticks to remove stains. - Collapsible Hamper; use it for dirty clothes. If you have to do laundry while you’re on vacation, you’ll have something to carry it in. If not, it will keep the floor less cluttered and make packing for home easier. - Ear plugs for you. -Take Ziploc bags for making daily snack bags, dirty clothes, liquid items etc. What color is your suitcase? Mine is black, like everyone elses! I put NEON yellow luggage tags on it, so does everyone else! I Pak Nak'd my luggage, did you? "What exactly is a PakNak?!" PakNaks are fun soft rubbery 3-D decorations for kids (and adults too!) to personalize all of their stuff. Backpacks, lunchbags, headbands, computer bags, household items, the list is only limited by your imagination. "How does it work?" you may be asking. They use a super strong adhesive that sticks to all of the stuff in a kid's life. Each PakNak comes with one of 40 plus designs and customized velcro® that makes them interchangeable, weather resistant and quickly and easily adhered to your surface. The best part? You can change your look by simply pulling off one design and sticking on a new one to create a whole new style. It's easy and fun to rip and stick with PakNaks. WIN: 24/7 MOMS and PakNak are giving away a whale PackNak, a bird PakNak, and a Penguin PakNak to ONE lucky reader. To enter for your chance to win . Deal of the Day - Starting June 25th 2009, The Glidden Paint company is hosting a National paint giveaway . Click here to the Glidden Paint web site then pick out your favorite paint color and they will send you a FREEbie quart of Eggshell finish paint. SIMPLE and FREE. The first trip we went on with my son, then 1 1/2 years old was a true learning experience. As we got out of the car with our carry on luggage, stroller, car seat, and child in tow (all but the stroller and child on the luggage cart) we made our way to security. Little did we know this was the beginning of a LONG trip through the security gate. Once it was our turn to go through the metal detector we were told EVERYTHING had to go through the x-ray machine, including the stroller our child was content in. So, we took him out and made our way to get it through the machine. Then we were told we needed to take all liquids out of our carry ons, hmm how do we do this quickly with a one year old on the loose? Then to top it all off we were told we all needed to take off our shoes and put them through the machine as well. By now all the rest of our possessions have made their way to the other end of the machine, awaiting for us to pick them up. If I would have only know about See Jane Fly! See Jane Fly has teamed up with Clear to offer exclusive pricing on a clear membership. Sign up for one year at $174 and save $25 off the annual membership fee of $199! Members can bring children 11 years old and younger with them through the Clear lanes for free. No more herding small children along as you inch through endless lines- and say goodbye once and for all to evil stares from fellow travelers. With Clear, cardholders breeze through airport security-usually in five minutes or less-and are escorted by Clear concierge through the lane. All that time saved means you can sleep a little later, arrive a little later, or give clients a few extra minutes of your time before boarding that flight. With Clear, you get to eliminate one of the biggest hassles of flying. Clear members have access to designated express airport security lines at over 20 major airports, including San Francisco, Oakland, San Jose, Atlanta, Denver, select terminals at JFK, LGA and Newark, with more airports signing up every day. WIN: 24/7 MOMS and See Jane Fly are giving away two See Jane Fly Parent Cards to ONE lucky reader . To enter for your chance to win. Discover this Summer what fun you can have for FREE with this weeks Take 7 Challenge. 1. REI Pass port to Adventure- Show kids how rewarding it can be to spend time in the outdoors. That's what the REI Passport to Adventure program is all about. Designed for kids aged 5-12, it's a fun way to connect them to the natural world and start them on a lifetime of outdoor recreation and stewardship. Kids earn a FREE prize when they complete activities. 2. Freebie MOVIES all summer long -Free Movies at Regal Cinemas Family Fun festival. When school’s out, kids around the country visit selected Regal theatres for the Free Family Film Festival. It’s a fun-filled nine weeks of movies for kids and parents. Since 1991, Regal has provided this service to the community, and best of all it’s FREE! Selected G & PG movies start at 10AM each Tuesday and Wednesday during the festival. First-come, first-served seating is limited to theatre capacity. The Free Family Film Festival is safe, lots of fun and a great way for kids to spend a weekday morning in the summer. Tickets for our 2009 Free Family Film Festival are exclusively available at select theatres’ box office on the day of the show. Click Here to find a theatre in your area. 4. Free Museum Days - Target has a great list of FREE Museum entrance and discounts click here. 5. Free Days at National Parks - - d more than 100 National Parks that normally charge an entrance fee will waive their fees this Summer July 8-19 ( which is my Birthday weekend) and August 15-16. And to make the fun even more affordable, many national park concessionaires are joining the National Park Service in welcoming visitors on this summer’s fee free weekends with the their own special offers. Keep your kids appetite for reading all Summer long with Half Price Books Feed your Brain Summer reading program. From June 1 - July 31, 2009 Kids ages 12 and under can earn a $3 Half Price books shopping card for each week they rad at least 15 minutes per day! 1. Get a Feed Your Brain reading log at your local Half Price Books..
2. Check off each day you read for 15 minutes or more. 3. Fill out your reading log, and have your parent or guardian sign it. 4. Bring your completed and signed log to your local Half Price Books. $3 Shopping Card good at all Half Price Books locations. 6. Repeat steps 1 through 5 every week through Friday, July 31, 2009. Mon, June 1 - Fri, July 31, 2009. Click here to find a Half Price Books location near you. 1. Kids read any eight (8) books of their own choosing. 2. Kids use the Summer Reading Journal to tell us their favorite part of each book. A parent/guardian signs the journal when it's complete. You can also get a Spanish-language Reading Journal. 3. Children bring their completed Reading Journal to a Barnes & Noble store between May 26th & September 7th, 2009. * Eligible books will be listed on the coupon. Choices must be made from available stock. No special orders. Limit of one (1) form per school-age child (grades 1-6), please. Incomplete forms will be ineligible for free books. Looking for a fun way to reward your kids for their accomplishments? Download and print free reward calendars to help your kids develop in areas that are some of the most common challenges of parenting. BOOKWORM WEDNESDAYS - Every Wednesday at 10:00 am beginning July 8th for six weeks. A fun and rewarding summer reading program developed to encourage young children to read during the summer months. BOOKWORM WEDNESDAYS entitles kids to free admission to a select children's film when they present a book report at a participating Showcase Cinemas, Multiplex Cinemas or Cinema de Lux box office. Accompanying parents or guardians and children under six receive free admission and do not need to submit a book report. Kids of all ages are invited to join the Pottery Barn Kids story time every Tuesday 11:00am to 11:30am. Members receive an official Book Club Card at their first story time, and a special gift after attending five story times. To locate a store near you click here. Kids 12 and under read any 8 books. 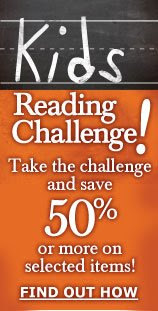 List the books you've read on the Reading Challenge Worksheet. Have a parent/guardian sign the completed worksheet. Bring your completed worksheet to any Borders or Waldenbooks store between May 26 and August 31 to save 50% or more on selected items. Library Reading Programs: Check with your local Library for their summer reading programs. check out www.summerreading.org for great resources.